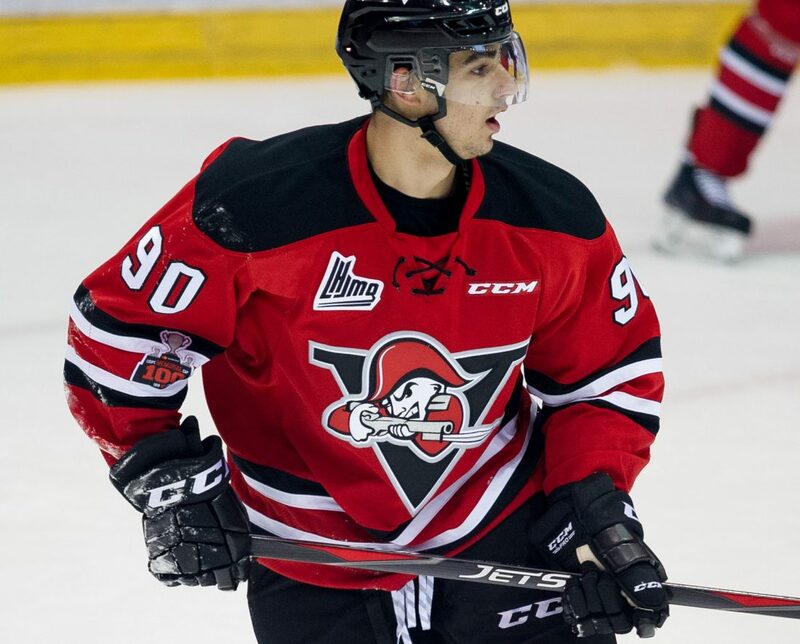 Joe Veleno is currently ranked #11 on McKeen's mid-season rankings, having finished his QMJHL season at 10th in league scoring. Six games after joining the Voltiguers in early December after carrying a heavy load for the Sea Dogs, he went on 13 game scoring streak on a deeper team, resulting in 8 goals, 22 assists and 30 points. Having fired four goals in five playoff games so far, a good playoff will cement a high draft ranking. Please Note - We are making this profile of Joe Veleno available as a sample of the scouting profiles you will receive with a subscription to McKeen's Hockey. Your subscription will include a 96 page PDF publishing on June 1st. We currently have over 90 2018 NHL draft eligible profiles done and will have at least 120 done by the time the draft arrives in June. You can learn more here. Here is the explanation of the grades we provide below. A note on the 20-80 scale used below. 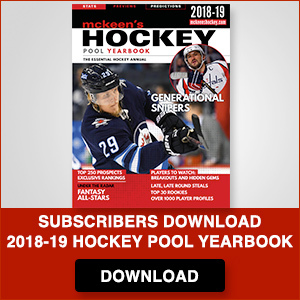 We look at five attributes (skating, shooting, puck skills, hockey IQ and physicality) for skaters and six for goalies (athleticism/quickness, compete/temperament, vision/play reading, technique/style, rebound control and puck handling). Each individual attribute is graded along the 20-80 scales, which includes half-grades. The idea is that a projection of 50 in a given attribute meant that our observer believed that the player could get to roughly NHL average at that attribute at maturity. Summary: Joe Veleno has had a target on his back since he was 15. He is the only exceptional status player in QMJHL history and has had high expectations since he put on a Saint John Sea Dog uniform for the first time. Last year, he was an excellent counter-weight with Julien Gauthier to a gritty top line of Matt Highmore and Spencer Smallman. This season, all of the top nine except for Veleno were gone, and that left the young forward as the lone star forward from last season’s President’s Cup winning squad. He struggled a bit under the weight of being the savior of the Sea Dogs, and was exchanged to a young-but-strong Drummondville squad in December. The pressure of being a sure-fire first rounder on a team going nowhere clearly got to him in the early going, and he was trying to do too much on all areas of the ice, playing out of position at times and overextending his shifts. The trade to Drummondville reinvigorated his season, and he has had much better offensive numbers among a number of talented Voltigeur players. Veleno’s impact on a game is often the same game-per-game, but it is not always on the scoresheet. He can create space with linemates by drawing defenders with his presence, picking a scoring chance out of an opponent’s pocket on the backcheck, or anticipating and transitioning a broken play towards the opponent’s goal. He had a 12-game point-streak after joining the team, and has helped recover some of his draft stock by maximizing his teammates’ talents and being the centerpiece of a strong team. He could resuscitate his draft stock completely with a strong playoff, and this spring could mean a whole lot for his future.